Writing today in the journal Proceedings of the National Academy of Sciences, the team, which includes one of the scientists who identified the endangered Barton Springs salamander, warns that more severe droughts caused by climate change and increasing water use in Central Texas have left groundwater salamanders "highly vulnerable to extinction." The groundwater salamanders of Central Texas—just 2 to 3 inches long—swim in springs, underwater caves and channels deep within limestone rock and are keystone species in the local Edwards and Trinity aquifers. As top predators, they help maintain the health of aquifer ecosystems, meaning they are key for preserving water quality in the aquifers that local residents depend on for nearly all the fresh water supplying nearby cities, industries and agriculture. The loss of these salamanders would compromise the delicate aquifer systems of which they are a critical part, the biologists said. "Even if people do not care about salamanders, they care about maintaining the quality of the aquifer systems that provide most of Texas with its fresh water," said David Hillis, professor of integrative biology and senior author of the paper. "Fortunately, what's good for the salamanders is also really good for the people. What we need to do to protect these salamanders also happens to be the exact same things we need to do to protect the water resources that ranchers, cities, homeowners and everybody else depend upon." For years, Central Texans have worked toward preserving several threatened or endangered salamanders, many of them discovered because of research by Hillis and his colleagues. The new paper adds to this body of work, which has led to protections for the Barton Springs salamander, the Austin blind salamander, the San Marcos salamander and the Georgetown salamander through entities such as the Edwards Aquifer Authority, which addresses an aquifer segment that supplies water to San Antonio. One of three newly identified species, which is yet to be named, is critically endangered: a tiny, golden-colored salamander that lives only in a small area near the Pedernales River west of Austin. The scientists also discovered that the Georgetown salamander, which lives in springs near Lake Georgetown and already has federal protection as a threatened species, has a much smaller range than previously thought and, thus, is far more endangered. "I think the U.S. Fish and Wildlife Service should review the status of all these salamanders in light of the new evidence," Hillis said, referring to the process for assessing the conservation status of species under the Endangered Species Act. 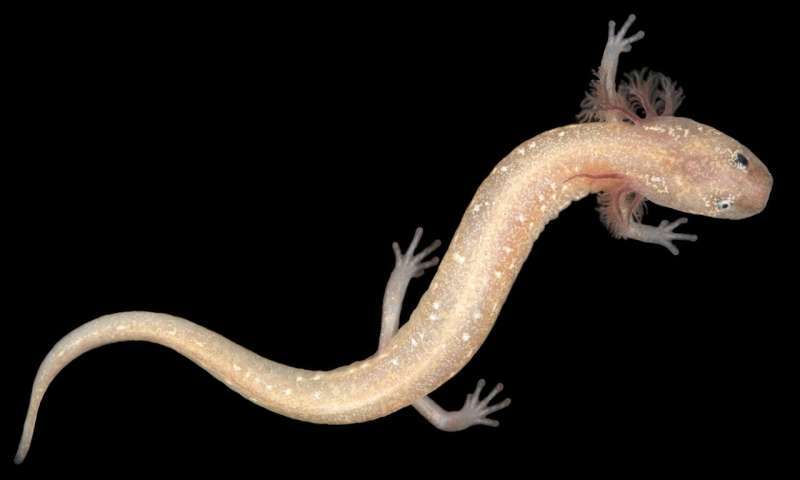 "They are part of the rich biological heritage of Texas, and losing these groundwater salamanders would be a huge loss for our state's biodiversity. Importantly, protecting these salamanders also means protecting the quality and quantity of fresh water that Texans rely upon." For the new study, Hillis and other researchers delineated the geographic ranges of more than a dozen Central Texas groundwater salamander species by studying the genetics of preserved specimens, collected over several decades and stored in the University of Texas Biodiversity Collections. First author Tom Devitt, currently an environmental scientist with the City of Austin's Watershed Protection Department, carried out the genetic analyses while still a postdoctoral researcher at UT Austin working with Hillis, helping to identify the three species previously unknown to science. Found nowhere else in the world and difficult to study due to the inaccessibility of their underground habitats, these salamanders, Devitt explained, represent a kind of mystery and rare beauty, a legacy of wildness that lives on despite a rapidly changing landscape. "There's a whole underground ecosystem all the way from Salado to West Texas that many people don't even know about," Devitt said. "Within it are these endemic species that are found nowhere else on Earth."